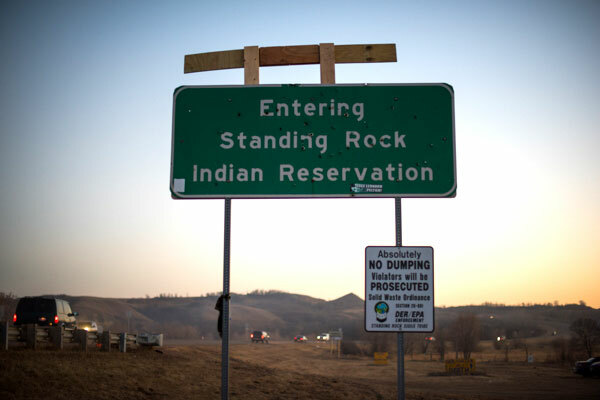 San Luis Obiso County photographer Brittany App captured the bullet-holed sign upon entering Standing Rock. 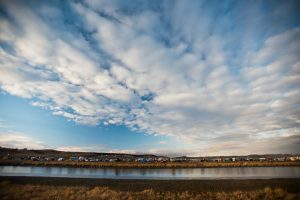 A controversial oil pipeline is being built on private property near the reservation. 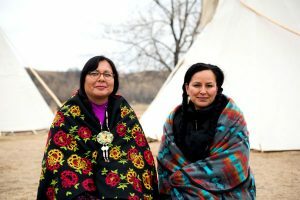 —Dozens of celebrities including Leonardo DiCaprio, Shailene Woodley, Lenny Kravitz, Neil Young, Ben Affleck and Mark Ruffalo have come out on behalf of protestors at Standing Rock. Likewise, dozens of local residents of San Luis Obispo County have traveled to North Dakota to join thousands who are opposed to the construction of the Dakota Access Pipeline or “black snake” because, they say, it threatens the ecological stability of the region. 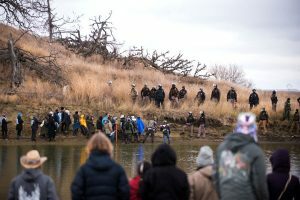 The protestors for months have withstood continuous pressure from the Morton County Sheriff’s Department under the leadership of Sheriff Kyle Kirchmeier, and the National Guard. 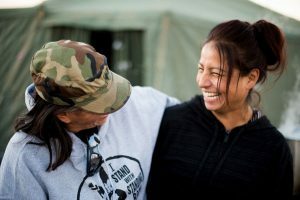 Inglish, who is a mechanical engineer and a singer-songwriter, loaded up her RV with donated supplies and drove 1,600 miles with her friend Brittany App to join an estimated 12,000 people now camped out in the pipeline conflict zone. They handed over propane, solar panels, winter clothing, head lamps, batteries, food and warm socks to the Standing Rock campers, all donated by dozens of San Luis Obispo residents who either attended a November fundraiser in Atascadero or were friends, or friends of friends. 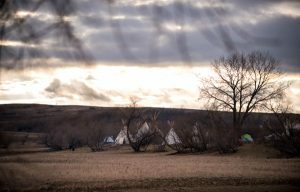 Photos by Brittany App taken at Standing Rock the last week of November 2016. 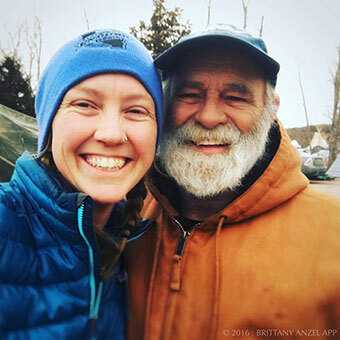 A selfie by Brittany App with Alabama photographer John Wathen at Standing Rock. App says she photographed and interviewed a number of protestors for her documentary. 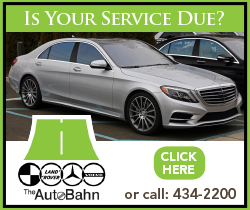 She was also inspired by a man named John Wathen, a photographer and Vietnam veteran from Alabama, who told her, “North Dakota is the most lawless state I have ever seen,” comparing the situation to the ‘60s and saw how Alabama state troopers treated civil rights activists known as the Freedom Riders. 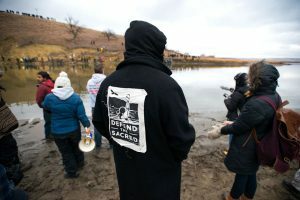 The ACLU has reported as many as 76 law enforcement agencies gathered near Standing Rock to stifle the protestors. 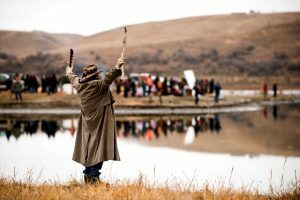 The pipeline would carry oil from North Dakota to Illinois, and would cross both government and private land. 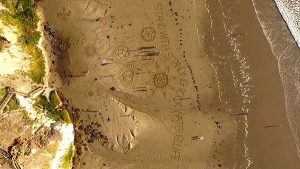 Protesters say that the construction would disrupt sacred sites. 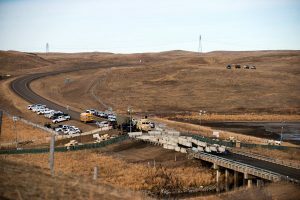 On Nov. 30, North Dakota Republican Sen. John Hoeven spoke out against the Obama Administration and the protestors, insisting that “the pipeline is already 98-percent complete in North Dakota, and 86-percent finished overall,” according to a Huffington Post report. “It’s past time to get this issue resolved,” Hoeven said. 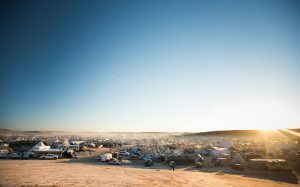 On Mon., Nov. 28, North Dakota Governor Jack Dalrymple ordered mandatory eviction of the Standing Rock protestors. 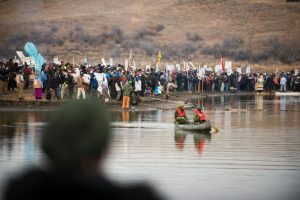 The U.S. Army Corps of Engineers had previously announced plans to remove protestors from the pipeline conflict zone by Mon., Dec. 5. While no forcible evictions are expected, on Nov. 30, the Morton County Sheriff’s Dept. announced it would impose a $1,000 fine on those bringing food and supplies to Standing Rock. 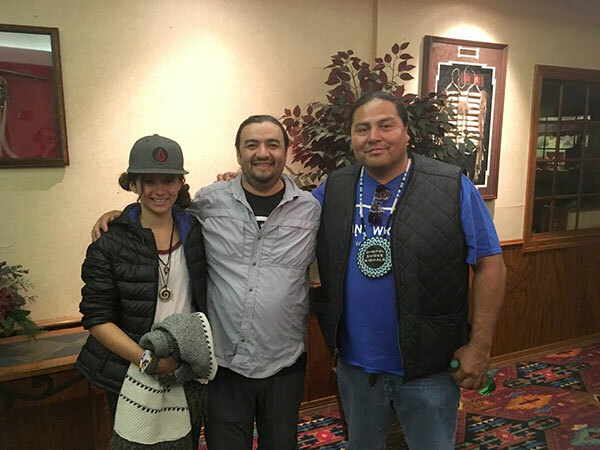 Middle-schooler Liliana Monge with her father Roberto and Myron Dewey, founder of Digital Smoke Signals, which flies drones to capture Standing Rock footage (courtesy Roberto Monge). 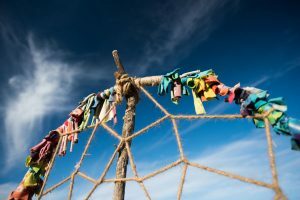 Monge said that since October he has been aware of at least six caravans that have left the county headed for Standing Rock.